After 12 weeks on the DRT programme, I am convinced that what we do off our horses is crucial to being able to ride on the horse. Six months ago I had no muscle tone, a muffin top and limited core activation. NOW I have found my deep seat, I can ride with balance, and feel my horse’s movement. I believe this programme is a must for anyone doing any type of riding or simply wanting to feel great. Thanks DRT and Nicola! Thank you for a great program. Your exercises were unique to me and very well explained. I got behind in the program but I loved the no stress approach to continuing on at my pace. The homework session was the best! It got me riding comfortably without stirrups. My posture and balance improved. I was able to target my tight and tense areas and change them. Hi Nicola, DRT1 and DRT2 have been amazing, I have been carrying a shoulder injury for 9 years and a combination of the strength training and the Yoga have enabled me to regain the full motion of my arm and it’s now relatively pain-free. DRT1 and 2 have helped enormously with my seat and my riding, I have 2 horses and the youngster can be a challenge. I would highly recommend your programme for all to have a go at, combined with Yoga it’s fantastic. Dear Nicola, I really recommend your DRT programmes. Although I have been a keen rider for a while I never really felt fit & admit to being too lazy to attend a gym. When I heard about your DRT 1 & the fact that it said Dressage Rider Training it encouraged me to join. I have just completed DRT 2 & really recommend both programmes. 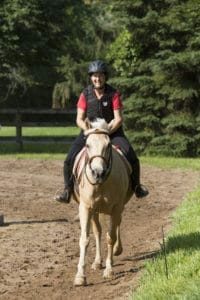 The DRT program has helped me be more aware of how I am impacting the horse with my body, it has given me better balance and enabled me to sit “deeper” in the saddle. I returned to riding very late and wanted to improve my fitness and stamina and also my technique. The programme has helped me to understand about having a strong core and that less is more when it comes to being effective in the saddle. The programme has also made me more aware of the impact I have on the horses movement. I want us both to be a team and to enjoy our time together. I love this program. It has helped me greatly both on and off my horse. 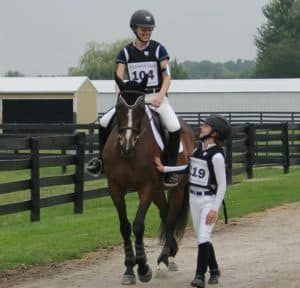 I am a jumper rider (and sometime eventer) And I feel like my position has improved greatly and my 6 year old jumper has gained straightness, balance and confidence because I do a better job helping him. 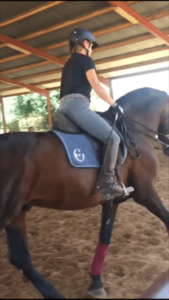 My chronic hip injury has improved a great deal and I feel much more even in the tack. I have recommended this program to many friends and I am going to repeat DRT 2 from the beginning. Even if I weren’t riding I would continue the program because I feel better. Thank you. I can’t thank you enough for developing the DRT program! 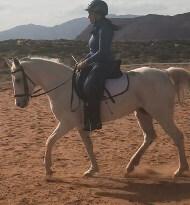 As an older rider I was struggling after taking over the ride on my daughter’s OTTB “Hogan”. The mind was willing but the body was not cooperating. My lack of fitness particularly core strength and flexibility was causing so much frustration. Since completing DRT 1 and DRT 2 I have improved dramatically! Hogan has a lot of suspension which made sitting his trot impossible for me before your program. My ability to now sit his trot is entirely due to DRT. I plan on continuing to revisit the workouts hoping that a DRT 3 will be in the future. A huge thanks, and congratulations for your program. I have so much more freedom to move my body in the way I need to, and strength building up to be able to reach towards my goals. 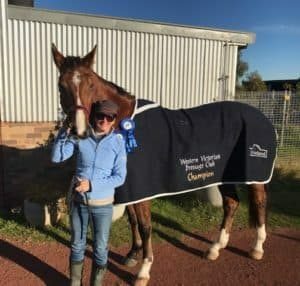 I have re-joined Adult Riding Club and am off to my first comp with them in 6 years next weekend! Hi! 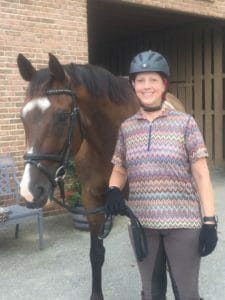 After almost 30 years without riding, I bought Quitage last year – and discovered that the self-esteem I had in the saddle was no longer there. After completing DRT1, my confidence has increased significantly and my physical strength and flexibility have been much better! I joined DRT 1 about 10 weeks before my biggest show of the year. 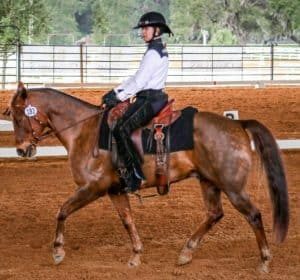 I had been planning all year to go to Florida with my horse for the Western Dressage Association of Florida’s championship show in November. I live in Vermont so this involved hauling my horse 1300 miles, coping with a drastic weather change and dealing with the added stress of such a big adventure. 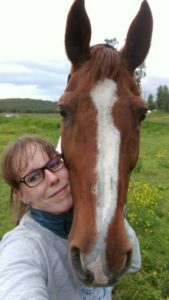 Because of your program, I felt stronger and more balanced and could feel the improvement in my horse because I was riding better. The trip went well, I continued the program (packed the Swiss ball!) and I was rewarded with the amateur level 2 overall championship. I loved the changes that I have seen in by balance, strength and riding while doing this training. I can’t wait for next show season. Nicola, I am so thrilled I found your Dressage Rider Training program. After a break of about 30 years, I went back to riding three and half years ago. I was 53 and had recovered from 10+ years of fibromyalgia. Needless to say, my strength and fitness were not optimal. About a year into riding again, I found DRT1 and signed up. I love the program. My strength, posture, and balance improved. My flexibility began to improve. I was able to ride longer, more comfortably. I signed up for DRT2 as soon as you made it available. I love it even more than DRT1. The impact of the program was noticeable to my coach within the first 4 weeks. I had some lingering weakness and restricted mobility, particularly in my shoulder girdle, as a result of having fibromyalgia. By the time I finished DRT2, I could do upper and lower planks. The mobility in my shoulders had increased significantly. My aerobic fitness had improved significantly and my posture on the horse was much better. 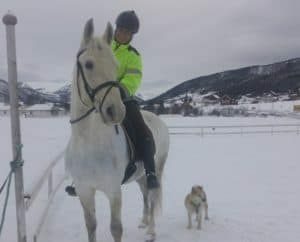 Last winter, Yukon, the horse I part-boarded, and I, had a difficult time in the indoor arena. He got spooky and I fell off. A lot. So, I did DRT2 again. I added light weight and increased the intensity. I really focused on my core and I was able to ride through my challenges with Yukon. I am still going through DRT2. Every time I finish, I start from the beginning, add more weight and challenge myself to do the exercises I couldn’t do previously. I am a member of your online gym. My plan is to add other workouts as time permits. I do yoga or a 20 minute workout every day. I ride 3 days a week. 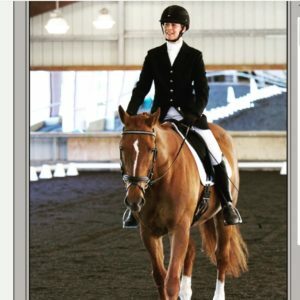 I use the on-horse homework to shape my practice rides. I hope to increase the amount I ride in 2018. Thank you so much for creating these programs and putting all of the really top notch content online. You are, literally, on the other side of the world from Canada. I am so grateful to have “met” you and to be able to learn from you. When you do DRT3, sign me up! This program has made me stronger, and as a beginner rider more confident. Even today in my lesson the school horse Buddy I ride, decide that he was going to has mini spook, jumped at a runner he saw outside the arena, I didn’t freak out (would have when I started riding in April this year), and then later his canter got quite fast I could feel myself slipping to one side but I was able to stay on, gripped with lower legs and money grip, he then slowed to a trot and I was able to get correct position. This too would have freaked me out, it did a little, and Bec my coach made me do it again – including trotting over poles. This time much better. Bec has been so encouraging, as are the other coaches. Thank you for a great program, I feel more secure in my seat, get on and dismount with more confidence and riding is improving. 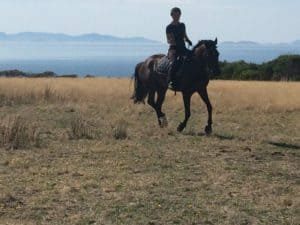 So much so that I have booked two riding holidays for next year, one with GlobeTrotters in Barossa SA, and other one in Ireland with Unicorn Trails. Think it’s fair to say riding has got hold of me. Thank you again. 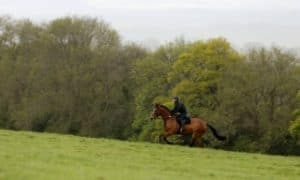 I am fortunate to have received support from Nicola for the last couple of years which has had a large impact on my ability as a rider and a trainer. 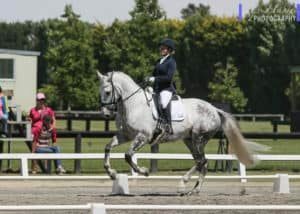 As dressage riders we are trying to make our horses use their body more correctly and evenly, and as they gradually become stronger we can add in more power and flexibility, with the aim that we have built up their body and mind gradually enough that they can physically and mentally handle the increases in difficulty, therefore having a positive effect on their body. 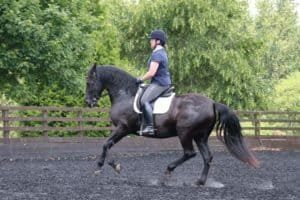 This programme is almost like putting yourself in your horse’s shoes; you learn new exercises some of which may at first seem quite challenging, but they soon become easier as your body gradually builds up the required strength and flexibility. By following the programme you are able to take things at your own pace, but in an order which ensures you are prepared for the increases in difficulty. 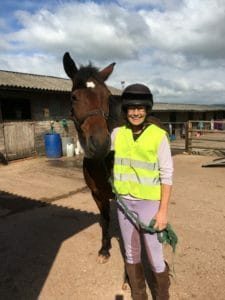 And because the programme is designed especially for riders you can be sure that everything you are working on has a very positive influence on your riding. One of the biggest benefits from this programme is gaining the ability to activate the correct part of your core when riding while remaining supple throughout your body. 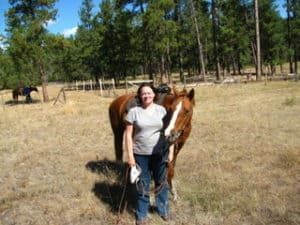 This allows you to independently use your aids which then makes it a lot easier for the horse to understand what you want, and for them to also use their bodies correctly. As well as the obvious physical benefits we gain as riders from doing this type of training, we also gain an understanding of what it is like to have someone push you to do things you sometimes find physically hard, so we can hopefully also be bit more understanding of some of the difficulties our horses may be going through in their training! 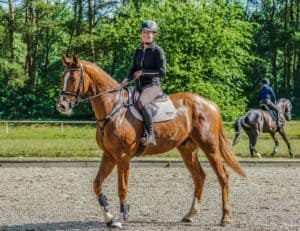 I can highly recommend this programme to all types and levels of riders, whatever level you are currently at you will definitely notice a very positive difference in your riding. Hello Nicola, Mercedes is a “rescue horse” which I adopted in November 2009, when she was two years of age, who has been working cooperatively with me ever since. She receives the benefit of my participation in your DRT programmes because, as I ride, the position pointers which you explain in your videos come to my mind, and by applying them during my riding I can improve my communication to my horses! I have enjoyed both DRT1 and 2. First of all thank you for an amazing program! 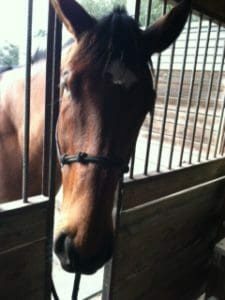 My horse, Gabriella, has been diagnosed with keratitis of the eye and it has been a bit overwhelming. She is receiving wonderful medical care and thankfully we have been continuing our hard work in dressage. Your program has kept me positive and motivated, particularly the Yoga Retreat. 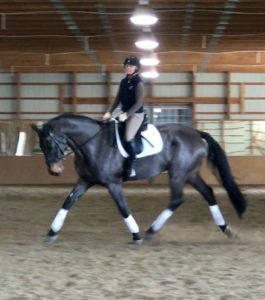 We may or may not be able to get back to eventing, but we are very happy with our progress and work in dressage-largely thanks to you and your program. I have just completed DRT2 and can’t wait for Nicola to pull together a DRT3. I started the journey with DRT1, which was great but DRT2 took my strength and flexibility to a new level. At 55, I feel fitter and stronger than ever before. 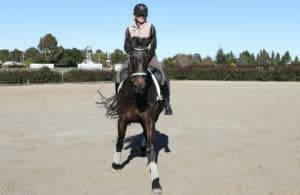 But the best news is that the combination of my body work with DRT2 and my horse work with my dressage coach, has also taken my riding to a better place. Aside from the physical benefits, DRT2 is completely doable. I work full time, study, ride and operate a farm – and I had no trouble fitting the program in to my week. Just me, my laptop, swiss ball and weights in my office during work breaks. Thanks Nicola and I really hope there is as DRT3 before too long. I love the program. It feels like I am working out with a friend – even my husband says ‘Hi, Nicola!’ in the mornings. I’m sure my riding is improving, simply because I am more aware of my body and its asymmetry. 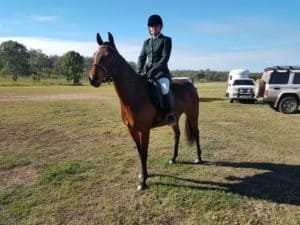 Also, one of my horses can spook, and a couple of times I think I probably should have been unseated, but have stayed in the saddle – that’s a real bonus, in my book! Hi Nicola, thanks for a wonderful programme, I have loved DRT1 & can’t believe how much it has helped me. 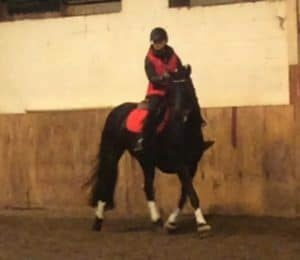 I’m a beginner rider so the core strength & balance I have gained has really helped me to make some incredible progress with my riding, but by far the biggest thing I’ve come away with is the confidence to give everything a go. Nicola, I have greatly benefited from your DRT1 program!! I hope to continue with your next program DRT2. Here is a photo of me and Soloist aka “Brody” his barn name. Loved the programme. Met my goal of being able to sit trot and have much more control over horses movement through stronger core muscles and more balance. Great value for money. Can do at own place, pace and timing. So here is the reason that I took DRT. At 57 years old, fairly large well I can now mount from the ground if I have to I prefer to mount from mounting block. Every now and again, my horse has a sideways movement. Now, I’m able to sit with no real difficulty. And because I want to continue getting better I’m really looking forward to doing the DRT2. Just finished week 12 today, pulling myself together and finishing of the program with one intense workout doing week 11 rider, + all three workouts of week 12. Probably won’t be able to walk the rest of the week! I absolutely LOVED the program! Absolutely perfect and just what i needed! So skillfully put together and built up, I’m amazed! Thank you so much for these last 12 weeks! Can’t wait to get started on DRT2! 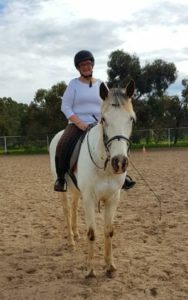 I am a 52 year old learner rider who realised that when I held myself better, I got a better response from my horse (a 15hh Connemara mare called Molly), so I set about improving my rider fitness. 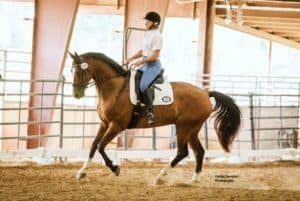 I came across the Dressage Rider Training program on Facebook, tried a couple of tester videos, liked what I saw, and signed up! I have easily managed to complete the 12 week course, it is eminently do-able because the workouts are only 20 minutes 3 times a week and therefore easy to fit in. I think what makes this course really work though are the explanations that Nicola gives throughout, the plethora of resources online to further our knowledge, and, most importantly I feel, the relevant homework. Stretching and foam rolling and eventually Swiss ball work only take a few minutes and really complement the workouts. Probably what makes this course so effective though is the ridden homework, which was a significant factor in my improving ability as it was relevant, flexible, and progressed as my core strength, fitness and flexibility increased. I have seen my confidence and ability on Molly improve more quickly than I think it would have with only riding lessons from my trainer. Friends at the yard where I keep her have commented on how much not only I have improved, but also on how much more relaxed and balanced and forward Molly is now. 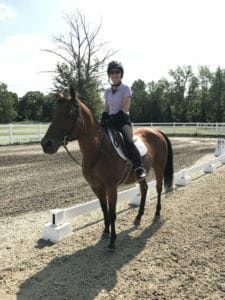 Dressage has not been Molly’s strength, she would much rather jump, so it is wonderful to see and feel her improving also. The course requires commitment but for me the motivation to carry on came from seeing improvements in my fitness and riding, and also hearing from others around the world via the Facebook group and online forum. 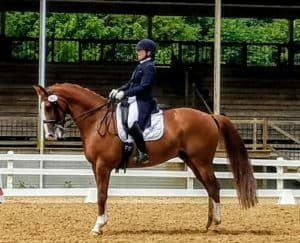 In a nutshell, I would highly recommend this Dressage Rider Training course and plan to do more. Having completed DRT1, I was looking forward to getting my hands on DRT2. It was as great as I wanted it to be. And again, it dramatically improved my riding. 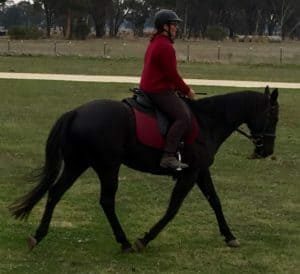 Multiple top trainers and knowledgeable spectators have commented on the change in my body, my core and noticed the improvement in my ability to ride effectively. Amateurs like me need to really transition from being passengers to being active members of a team that only together can achieve their goals! Nicola, you have given me some more of the tools to have a better partnership with my horse and to reach new heights in the sport I love so much. Thank you. Thank you for being part of my extended village in New Zealand. So, when are you rolling out DRT3? The DRT and DRT2 Programs have made a welcome change to my riding. 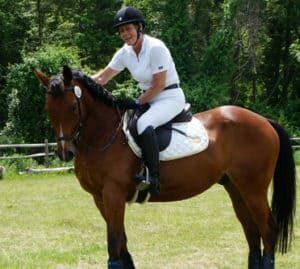 I had experienced hip pain and stiffness for many years and had seen photos of my riding where my legs and stirrups were uneven which concerned me. I had recently purchased a young horse and realised I needed to be more balanced, stronger and flexible if I was to get the best from her. While I had undertaken clinical pilates for a year and enjoyed some benefit I was drawn to the rider specific nature of DRT. I did have reservations about an at home program as I wasn’t sure how disciplined I would be exercising at home, but I needn’t have worried. Nicola is quite a rare find. Her tips and advice are timely and her enthusiasm is contagious. I feel like she is in the room with me with her timely corrections and encouragement. I look forward to our workouts “together”. 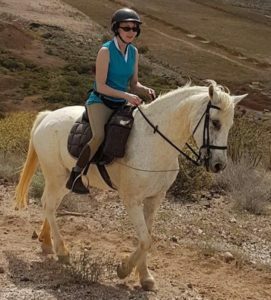 After completing DRT and the subsequent DRT2, I have more stamina, am significantly more toned and stronger, more supple and am more relaxed in the saddle than I have ever been. I am even in my stirrups and leg position and no longer point my toe out. I also have a greater awareness of my body and the muscles I use when riding. I truly believe this makes me a far better rider. 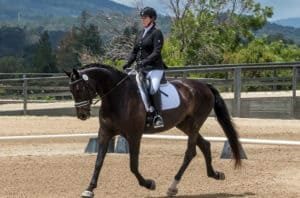 I am so pleased that I found DRT and recommend it to all dressage riders irrespective of their level of fitness. Just been riding in Spain on a 5 day intensive dressage week. Thanks to your program and your gym website I was really fit with a strong core that gave me a really good independent seat. Rode two horses. One was a huge Andalusian stallion (see photo) with huge movement. I was able to handle them and felt fit thru the whole week. I took you with me on my laptop which was great as I either did yoga or core work thru the week. Keep the programs coming! I have just completed DRT1 and DRT2 I can’t wait for Nicola to pull together a DRT3. 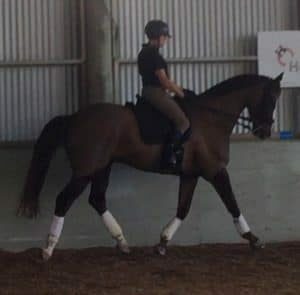 But the best news is that the combination of my body work with DRT2 and my horse work with my dressage coach, has also taken my riding to a better place. Aside from the physical benefits, DRT2 is completely doable. I work full time, study, ride and operate a farm – and I had no trouble fitting the program in to my week. Just me, my laptop, swiss ball and weights in my office during work breaks. Absolutely loved the DRT2 program! 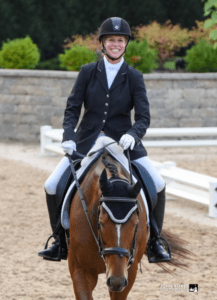 Found the focused exercises for the equestrian athlete to be invaluable and enjoyable. My personal trainer and horse trainer have both noticed an improvement in my fitness and riding ability. I’ve moved up a level, seen my dressage scores increase and my rider position & seat marks improve. Lastly, the time commitment is efficient and effective. 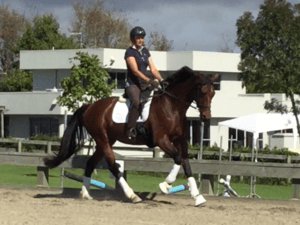 Nicola knows biomechanics and how to optimize a workout for the best results for riders. Highly recommend this program for all dressage riders! Can’t say enough great things about DRT! Love the workouts and how they are divided to include: core, strength, and stretching. The length of workouts is very manageable in a busy day. There are always alternate exercises if the degree of difficulty is not appropriate for you at this time. Riding homework is so applicable. Great improvements in my riding. Gabe( my horse) and I both thank you! Ready for more! Still haven’t conquered the swiss ball, but will truly feel a sense of accomplishment when I do! Bring on the next program. I have found the DRT2 program amazing. 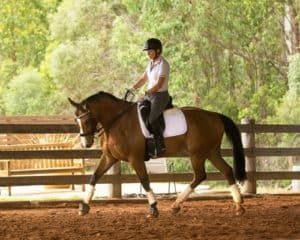 I am a biomechanics trainer and have found the selection of exercises and stretches really target all the correct areas for riding. 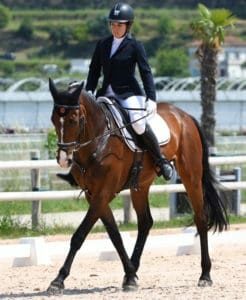 I think that DRT2 is not only beneficial for Dressage riders but anybody who wants to ride in a balanced and safe manner. My husband has really noticed the change in my body tone and says that I am generally looking a lot healthier. For me, 20 mins 3 times a week is doable. In my own time and as often as I want without having to leave home. If I want to do it at 11.00pm at night or 6am in the morning it makes no difference. The program gives easy and harder options for you to choose from and if there are some exercises or stretches that are a little bit hard you can leave them out or build up to them. 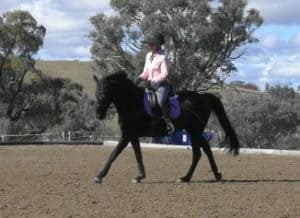 Thanks Nicola for a very balanced program that gives me some structure to exercise and work on the parts of my body required for riding. The DRT2 program is definitely a step up from DRT1. The workouts were more challenging but also more rewarding resulting in greater strength building and flexibility. Because of the spring/ summer season in the US, I’ve put the second half of the program on hold until prime riding and competitions slow down- there are only so many hours in the day for a full time working / barn owner/rider! Thanks for providing these awesome programs! 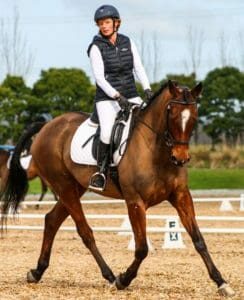 The programs that Nicola has created; both the DRT1 and DRT2 as well as a few of her other programs (CORE:30 and running programs), to aid the rider both on and off the horse has been more beneficial for me than words can ever begin to describe. 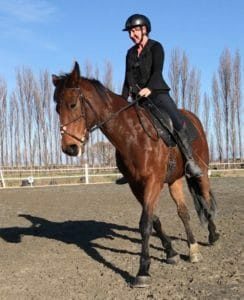 Her attention to detail and targeting of muscle groups related to riding have helped my riding grow, build confidence and strength in the saddle and has helped address balance problems. 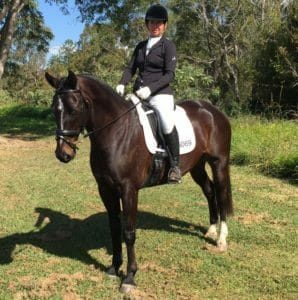 She has opened my eyes to the importance of cross-training to help achieve goals as a rider. 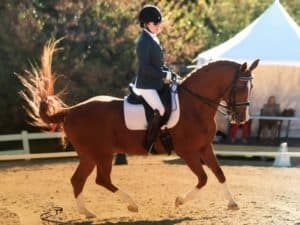 Whether the work is in the saddle, visualisation, or addressing the weaknesses of the body; as a show jumper who emphasises the importance of dressage in my training, these programs have benefited both me and my horses greatly. 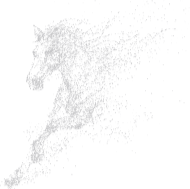 I recommend this program to anyone who is curious about growing their skills and strengths as a rider, it will open more doors and challenge you in ways that will only make the journey of dressage more enjoyable! 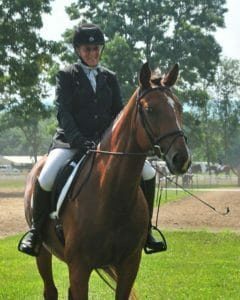 DRT1 has been one of the best things I have ever done for myself and my horse, “Hogan”. 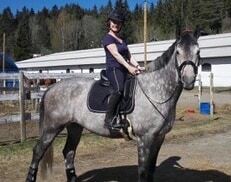 I am in my late fifties and took over riding my daughter’s 17-year-old OTTB 3 years ago. I am generally a very active person, riding six days a week and walking my dogs 3-5 miles every day. Riding has been a challenge for me in many ways. This old body is not as flexible or strong. Core strength in particular is so important. I felt that the training Nicola offered would benefit me and it has!! My core strength and flexibility, especially through my hips, has changed dramatically. Fitting her 20 minute sessions, three times a week is very doable. I have a very busy schedule often starting most days at 5:00 AM and not getting home until 8:00 PM and yet managed to complete DRT1. My riding in general has improved. 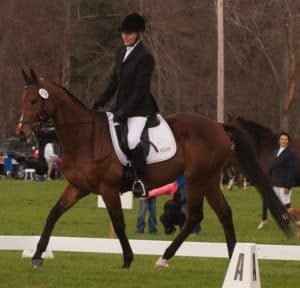 I am an eventer and have found this program has helped not just my dressage but my jumping as well. I cannot wait to start DRT2!! Thank you Nicola for developing this program !!!!!! (Hogan thanks you too?). Nicola, your program has helped me develop a much stronger and secure seat – and I’m in my 60s and have had both hips replaced! I have really benefited from completing DRT1. At first it was a bit of a reality check as I’d always considered myself relatively supple (turns out I wasn’t! ), but knew I was lacking core strength. I’ve really noticed the benefits of doing the workouts. 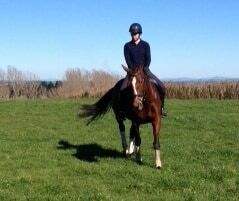 I feel more balanced in the saddle and able to complete exercises easier & my horses are happier for it too. Both are very sensitive Iberians and make it pretty clear if there is any tightness or tension anywhere. Both my regular trainer and my other trainer who I see on regular clinics (he’s a senior rider at the Spanish Riding School of Vienna) have really noticed the difference, especially the latter, who saw me last at around week 8 of the programme & commented on how much my riding had improved (even by then), & how much this had improved my horse. The attached photo is from that last clinic. It will be interesting to see what he thinks on our next clinic at the end of August. Looking forward to completing the Yoga retreat and then moving on to DRT2! Thank you for a great programme. I have learnt so much, about neutral spine, my own body and what I needed to work on. The program allows you to work on parts that are stiffer which was really great for me. Best of all the program was fun and easy to fit into a busy routine with only 20 min workouts. I would very highly recommend this program to all riders, especially dressage riders, or even those that struggle with pain and stiffness. Thanks Nicola! I loved the program. It really got to the spots in my hips that other programs, not related to horse activities have addressed. It strengthened and loosened up my hips. I understand, so much better now, specifically how my body impacts my riding and what I can do about it. 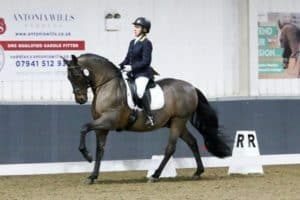 Everything is easier – strength, balance and posture, on and off the horse, and my awareness of my strengths and weaknesses in these areas has significantly increased and continues to grow. The workouts are different every time so it’s fresh and interesting but it also reinforces the work we’ve already done. Each workout pushes you further so every week I’m making progress that I can see and feel, but the increases in effort aren’t so difficult that it’s daunting to come back for the next work out. The articles are informative and often inspiring. The support that is provided is timely and effective. I find that my riding is so much more enjoyable and I look forward to continuing my own physical and mental journey in this direction. This has been such a rewarding undertaking. Thank you Nicola and DRT! Since I started the DRT1 Program I’ve felt a greater sense of overall well-being from being a stronger (middle-aged) woman. I can also feel more aware of how I sit on a horse and increasingly have the flexibility and muscle capacity to correct my position. I am at Week 8 now, and am looking forward to seeing how strong and flexible I can become. My riding has progressed amazingly fast after signing on to Dressage Rider Training. You know that feeling that you’ve plateaued? 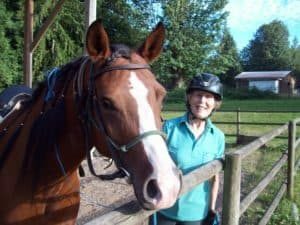 I had it, for years, where I didn’t seem to be adding much to my horsemanship… but oh my, what a difference after starting this program! It’s a matter of better control and understanding of my own body mechanics. I sit better, I’m considerably more confident, and it’s all because of those three 20-minute sessions a week. I cannot believe how my entire mindset changed to become so much more confident, but since I can do those exercises and work the muscles I need to ride, a lot of my fear and anxiety just… went away. I cannot emphasize enough how much this program has helped. 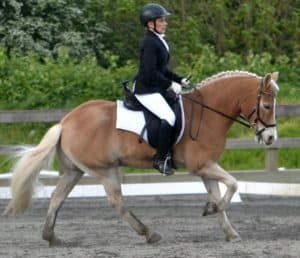 I am a mature amateur dressage rider and I invest quite a lot of time and money into my riding including weekly professional coaching and attending clinics with international trainers, not to mention a small fortune in physiotherapists and feed supplements for my horse. I have to say though that DRT has been by far the BEST VALUE in terms of improved performance in my riding, and I had a lot of fun. Definitely the best investment you can make if you want to improve your riding. I always tried to work out because I am almost 53 and need to stay in shape to keep riding. I was never a fan of yoga but now I am! Thank you! I know I need to stay flexible. The fact that the program is for riders makes me get out of bed and work out before work! I really like it! Looking forward the next level! The overall program definitely help with my riding, posture and balance are better. I thoroughly enjoyed the DRT programme. My strength, balance, confidence & ability have all improved as a result. I have downloaded it all and will continue to use it & benefit from it. It was very useful being in contact with everyone taking the course via Facebook too. Thank you Nicola, I really feel I/we have benefitted so much from completing the course. The program helped me with my balance, posture and body strength. This program came at just the right time. I struggled with injury and my regular workouts were too intense and not enough focused on what I needed for riding. Starting this program with a trainer who understands what the rider requires, is exactly what I needed. The program helped with working out after rehab in a measured way but with the strong focus on core I felt the benefits very quickly. 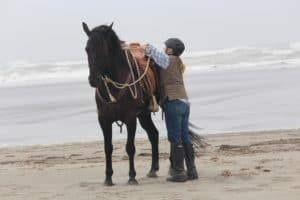 I learned a great yoga sequence to use as warm up before getting on the horse and it was just as beneficial after each ride to stretch more purposefully. I was an avid gym goer before this program but I highly recommend this program in addition to any regular workouts. It will challenge a seasoned fit person with modifications but if you are just starting out the program is designed to work with whatever level you are at! I would like to thank you so much for the huge improvements I had with your programs. It was really useful to improve my seat, balance and position on the horse. Really a professional support! 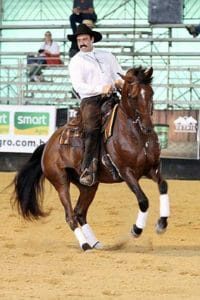 This here is a photo of me and my horse Carestina z.
I enjoyed DRT1 so much I signed straight up for DRT2. On completing DRT2 I have my fingers crossed for a DRT3! The program has enabled me to let go of my tight shoulders which has really freed up my upper body. It also made me aware of just how tight my pelvis and lower back were. Now I ride with a longer, stronger and more independent leg and a core strength that puts a smile on my face. So worth the money. I really enjoyed the challenges of your course. I am much more secure and stable on Fleur. I feel fitter and more confident in my riding.